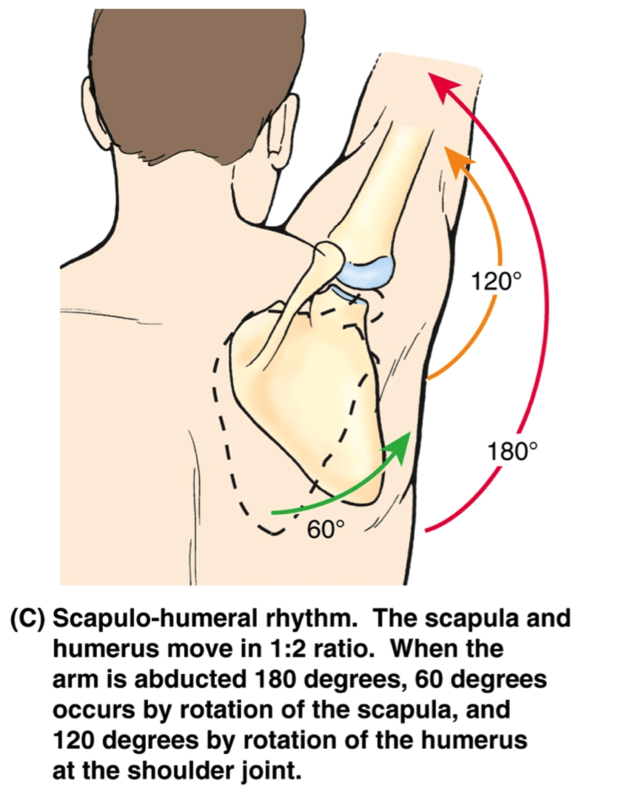 Scapulohumeral rhythm is the interplay between the scapula and the humerus during motion of the shoulder. There is a definitive pattern of interaction of scapula and humerus when contributing to the motion of the shoulder. Scapulohumeral rhythm is also called glenohumeral rhythm. Optimal function of the shoulder is reliant on the coordinated movement of the scapula and the humerus. When there is a change of the normal position of the scapula related to the humerus, the scapulohumeral rhythm is disturbed. Scapulohumeral rhythm may get disturbed in various conditions and lead to dysfunction of the scapulohumeral rhythm, termed as scapular dyskinesia due to changes in scapular position and control exerted by the scapula stabilizing muscles. Altered scapulohumeral rhythm affects the function of the glenohumeral joint and contributes shoulder impingement, rotator cuff pathology and shoulder instability. Scapular dyskinesis has been reported in 70-100% people with shoulder injuries including glenohumeral instability, rotator cuff abnormalities, and labral tears. Study of scapulohumeral rhythm forms an important part of the clinical examination of the shoulder. There is a three-dimensional scapular motion pattern during normal arm elevation that includes upward rotation, posterior tilting and varying internal/external rotation dependent [varying on the plane and angle of elevation]. Joints with minor contribution are sternoclavicular Joint and an acromioclavicular Joint. These results in a coordinated movement pattern of the arm elevation. All the joints continuously participate in the movements at different rates at different phases of elevation. While the limb is elevated overhead the scapula undergoes gliding/rotatory movement over the thorax turning glenoid cavity upward or downward depending on the direction of the motion. This movement occurs in frontal plane around an anteroposterior axis. Tilts in lateral-lateral axis [anterior and posterior tilting] External and internal rotation occurs around a cephalo-caudal (longitudinal) axis. In addition, there is external and external rotation in longitudinal axis [cephalo-caudal axis] which cause glenoid cavity more into the frontal plane [external rotation] or sagittal plane [internal rotation]. Glenohumeral -joint alone contributes 90-120°. The combination of scapular and humeral movement result in a maximum range of elevation of 150-180°. The movement is largely glenohumeral. Scapulothoracic movement is small and inconsistent. The glenohumeral and scapulothoracic joints move simultaneously. Overall 2:1 ratio of glenohumeral to scapulothoracic movement. the muscles do not shorten as much as they would without the scapula’s upward rotation, so can maintain the force through a substantial range of motion. The scapulohumeral rhythm can be defined as the ratio of the glenohumeral movement to the scapulothoracic movement during arm elevation. Scapulohumeral ratio is calculated by dividing the total amount of shoulder elevation (humerothoracic) by the scapular upward rotation (scapulothoracic). Humeral elevation: scapulothoracic rotation is 2:1 during arm elevation. Differences in BMI may cause different types of rhythms. A clinometer or inclinometer is an instrument for measuring angles of slope (or tilt). The inclinometer is capable of measuring angles (in degrees) from a horizontal reference to assess static positions of scapular upward rotation. This uses tape measures for linear assessment and compares abnormal motion between the pathological and healthy scapula. This examination is based on simple bilateral visual observation of scapular position. Position 3 – Internally rotated and abducted arm to 90°. The motion can be x-rayed and studied. Therapy needs to be individualized. The causative factors need to be determined and then addressed accordingly. Functional training [sports] if required.